Hello friends! 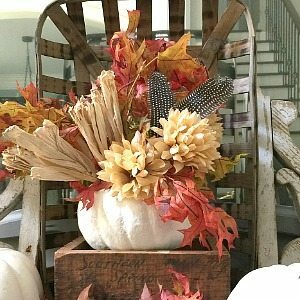 Today I’m sharing my monthly 10 minute decorating post – an easy 10 minute Fall Bouquet and Tray Decor idea – to give you some inspiration to decorate your home for autumn even if you don’t have much time! 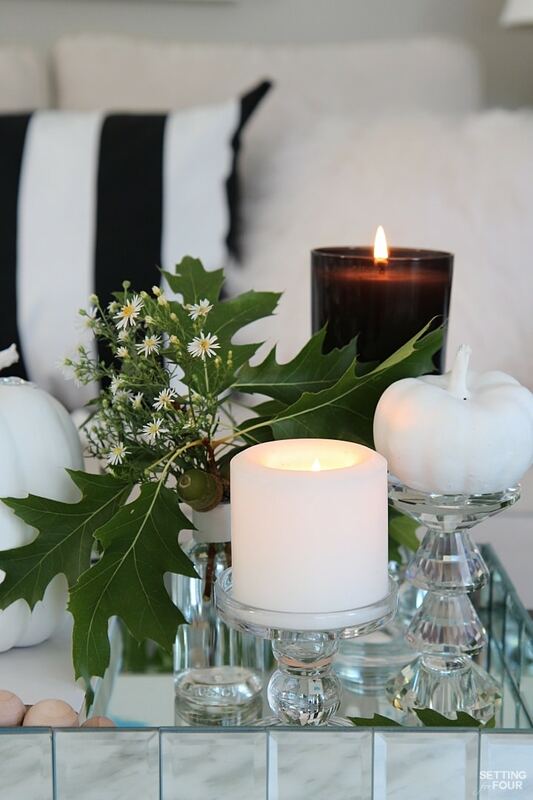 Plus 11 more bloggers have joined in to share their gorgeous 10 minute fall ideas too! If you’ve been around Setting for Four for a while – you know I love to bring the beauty of nature inside! 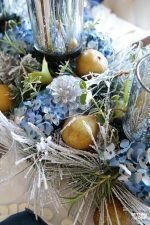 I just LOVE decorating with pretty flowers and natural elements like leaves and branches that I collect from my flower gardens, our yard, the gorgeous woods and trails near our home. Not only is it a beautiful way to add color to my home but it’s also FREE! 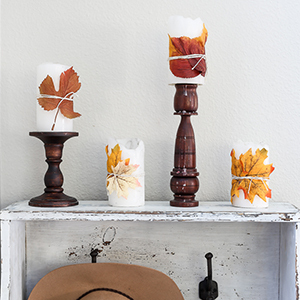 This decor idea is also perfect if your love neutrals and are looking for a way to decorate for Fall without using orange! 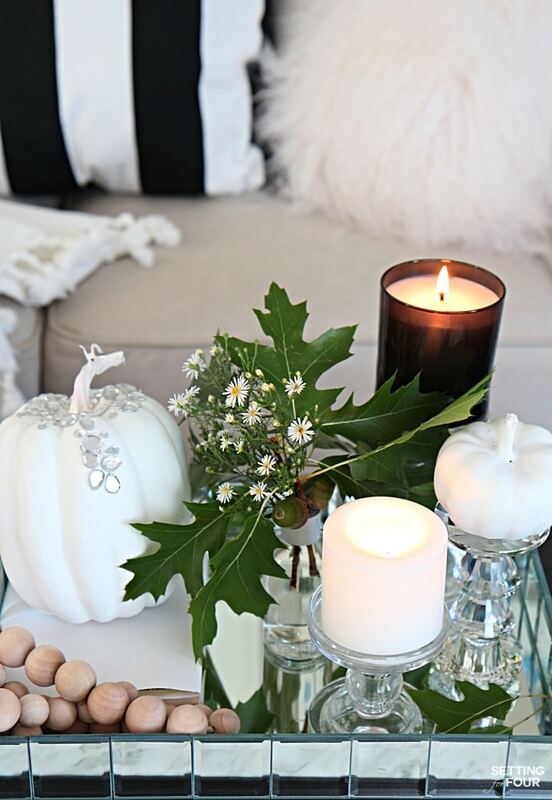 I put together this easy fall decorative tray for my living room coffee table in just 10 minutes – I’ll show you how! 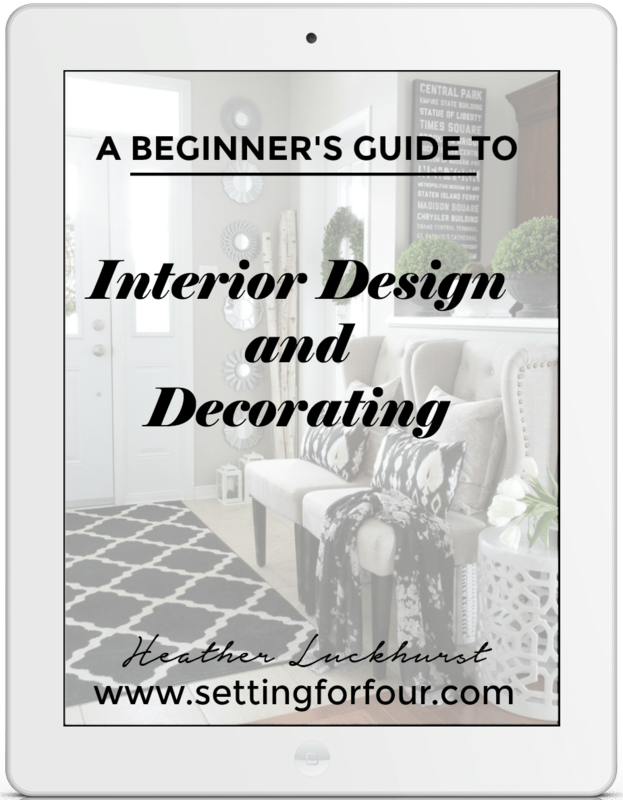 Start with a decorative tray: I have lots of trays and I love to move them around from room to room. 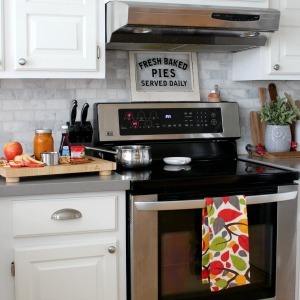 You could use a round or rectangular tray for this decorating idea!This is a pretty rectangular mirrored tray I’ve had for many years – I love the sparkle! 2. 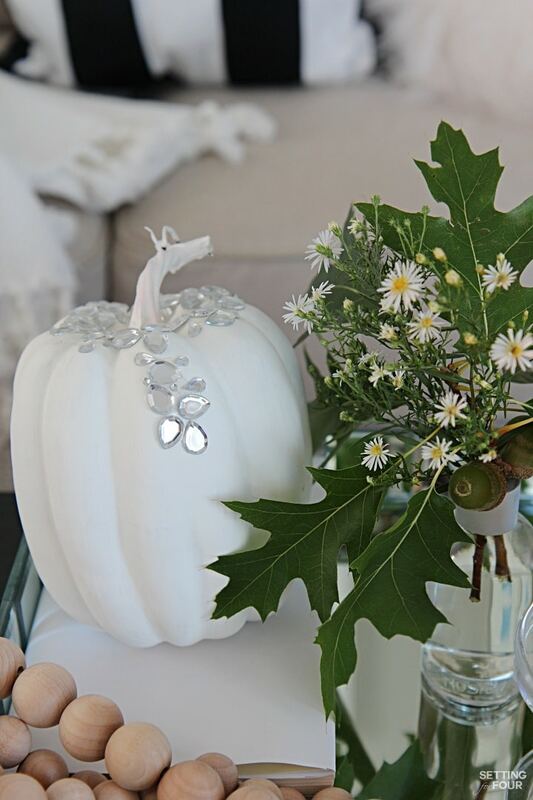 Add an iconic fall decorative object or two: I used one of my DIY Glam Pumpkins I made a while ago – this is one of my favorite Fall DIY projects and a big reader favorite (it’s very simple to make!). I put the blingy pumpkin on a book to give it a bit of height. 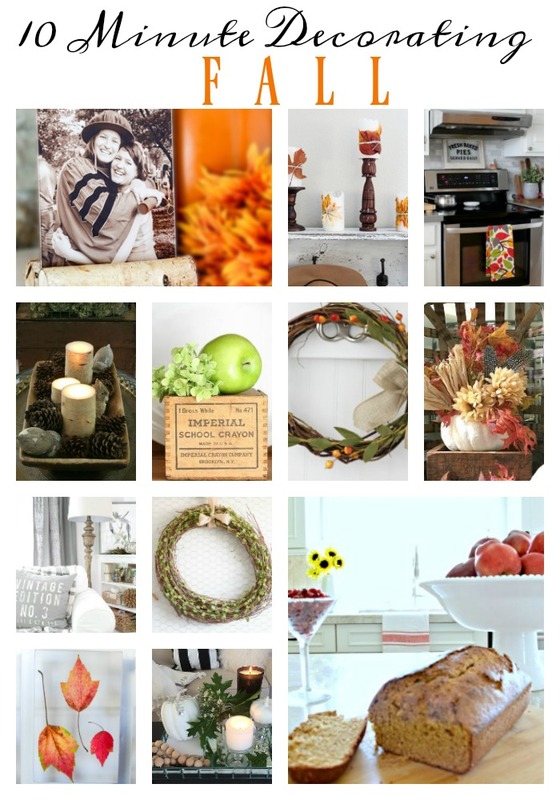 If you’re not into pumpkins you could add a little bowl of acorns, a squirrel figure, an owl…. 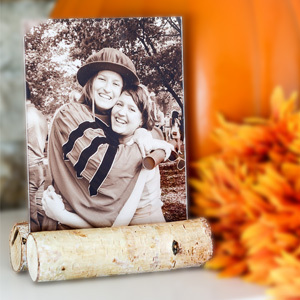 anything that makes a seasonal fall statement. 3. 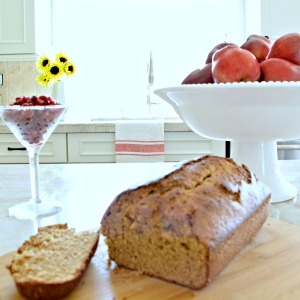 Add a variety of heights to your decorative tray. This gives the tray interest and makes it less flat looking. 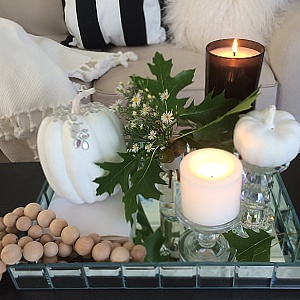 I flipped a crystal candle stick upside down to display this mini white pumpkin! 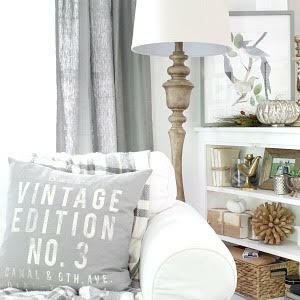 The wide base on a candlestick is a great place to set small decorative objects on – and gives them more of a presence! 4. 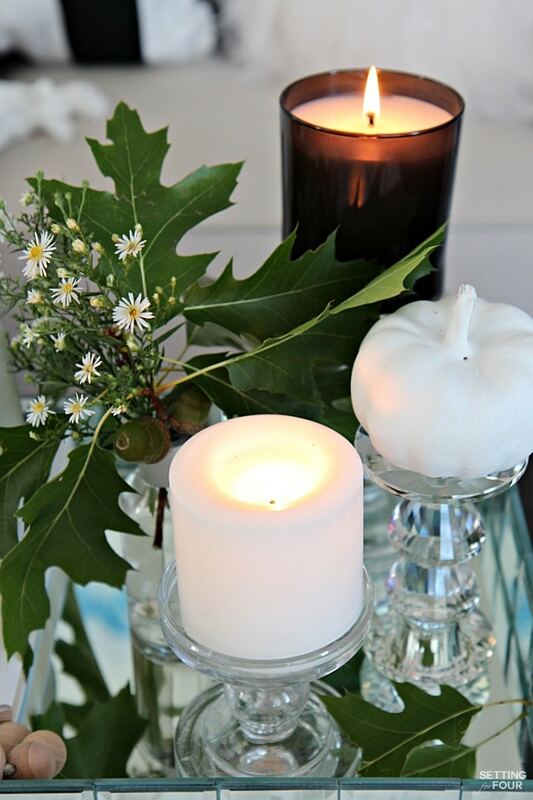 Add pillar candlesticks and pillar candles: I added two glass pillar candle holders… and added a white candle to one at the front and a black candle to the taller one at the back. 5. 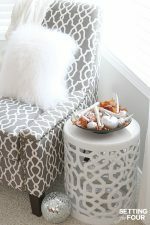 Add a decorative objects to lay at the bottom of the tray and drape over the edge: I put a string of round wood beads into the tray and let one edge fall over the side a bit. The natural wood is a pretty contrast to the glass and shine! 6. 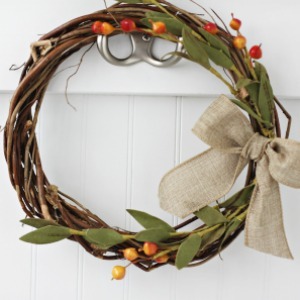 Add a Fall bouquet of leaves and flowers. 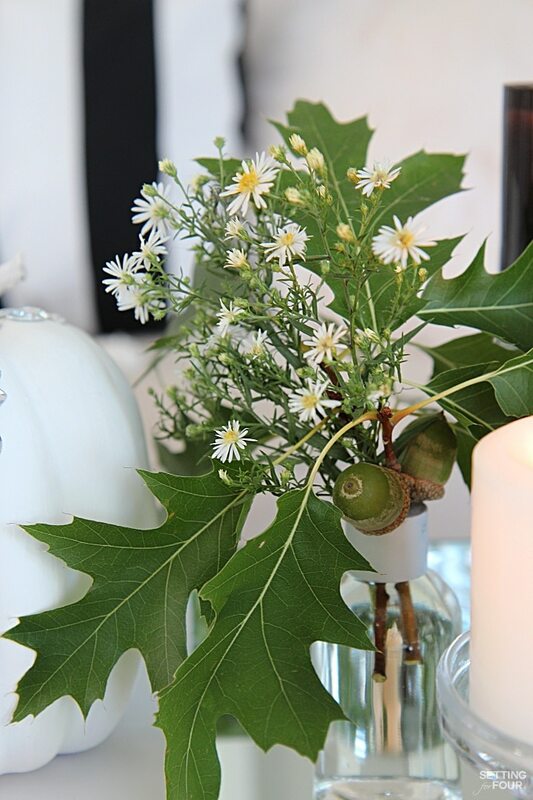 I made this little bouquet up in just seconds using wild asters that are in bloom here right now and oak leaves with acorns. They grow on a trail near our home and I picked them the other day when I went for a morning walk. Isn’t this bouquet pretty! 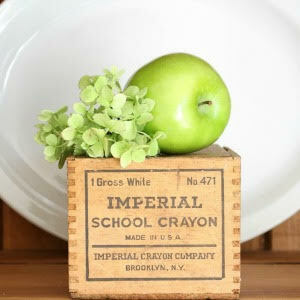 Such a pretty pop of green, white and yellow! 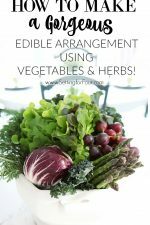 This bouquet would be a stunning way to decorate a fall table too….and would be GORGEOUS for a fall wedding reception! Can you imagine them all lined up down the wedding reception tables? Sooooo stunning! 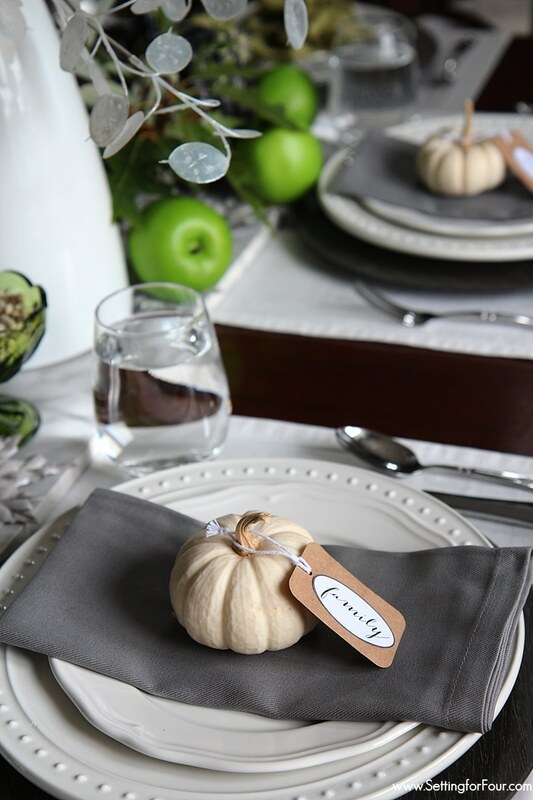 I hope you enjoyed my Fall Bouquet and Tray Decor Idea! 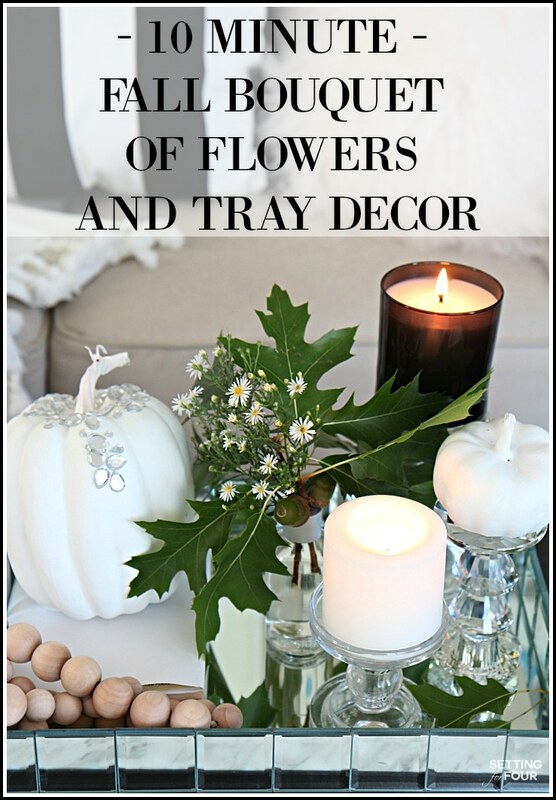 Do you love to decorate with Fall flowers and trays like me? 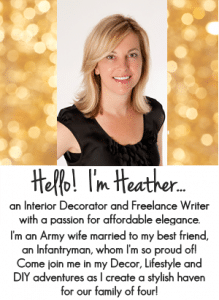 Bring the look into your home! 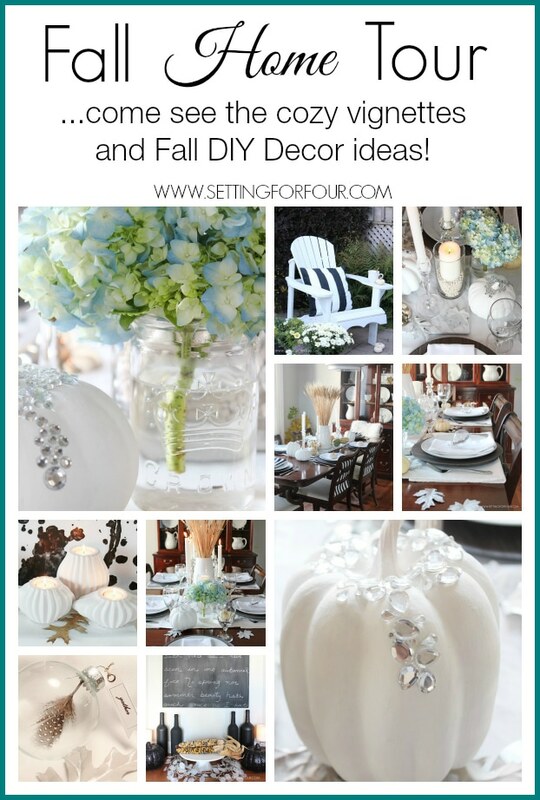 Here are 11 more 10 MINUTE DECORATING IDEAS – decorate your home in a jiffy for autumn with these beautiful decor ideas that can be finished in just 10 minutes! 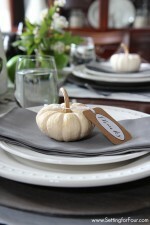 Easy Pumpkin Decor with Printable ‘Give Thanks’ Tags – perfect for your Thanksgiving Table! 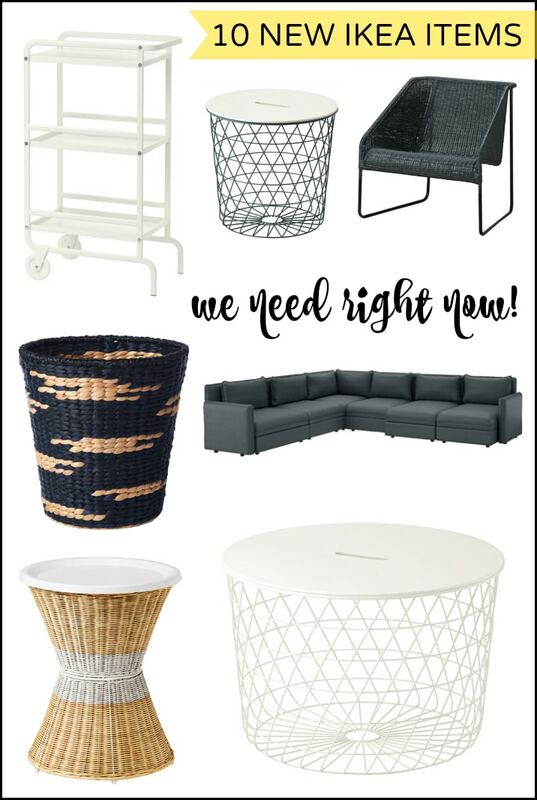 New IKEA 2016 Fall catalogue items we need right now! 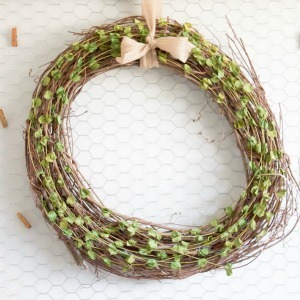 Simple and sweet, never thought to use the leaves in a bouquet! Great idea!! 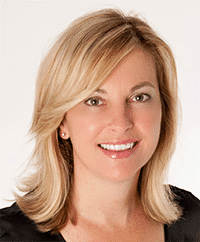 Thank you Christie for sharing your memories with me! When my boys were little they would pick me flowers too and I’d show them off as well!!! Even if they were a bit crushed and bent lol! 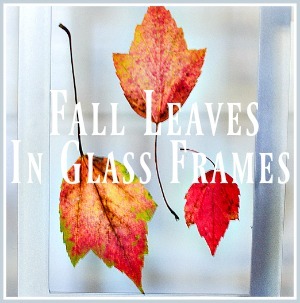 So glad you are enjoying my blog posts – have a beautiful day!! SO beautiful! LOVE the sparkle! THanks Kristi – I love sparkle too- especially for Fall and winter when the days are more cloudy and gloomy! I’m loving the bling, so pretty! Tonight I discovered what you do. I greatly admire what you see and a good source of inspiration for me. I want to not miss a post!